Each day that passes takes a big step in the field of mobile technologies offering innovation scenarios applied in the healthcare sector development and create opportunities for business that can´t be missed. 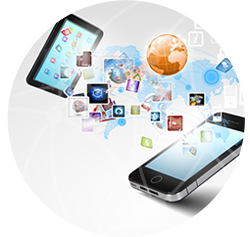 Immersed in the scenario of mobile technologies, the world of Apps has grown unstoppable . We are aware that the Apps developed and created in the field of healthcare can get to change the healthcare system as we understand it today. Therefore, from Mobiliza Consulting we developed applications centered in the field of healthcare for mobile devices for different operating systems (iOS and Android). Our differential value is the extensive knowledge of the needs of healthcare professionals , and over 10 years of experience in the healthcare sector of our consultants, analysts and programmers. ONCOLOGIA3G ( O3G ) Magazine for iPhone , iPad and Android Oncology ISSN electronically published research in this area. Regio has been created by and for the scientific community who want to publish in Spanish in the international arena on issues of Oncology. Software Manual for Mobiliza Clinical PC. Clinical Pc is an Electronic Health Record software specifically developed in collaboration with healthcare professionals to cover the healthcare needs and managing a clinic. Manual on the Treatment of Cancer oncology patient support . MANUAL STOP . The manual contains all aspects of the treatment of the patient divided into chapters based on the evidence and grades of recommendation with cancer support.